Governor, State of Osun, Ogbeni Rauf Aregbesola has described workers in the state civil service as treasures deserved to be honoured and celebrated by his administration. Aregbesola who commissioned 2.8km dual carriage road named ‘Workers Drive’ in Osogbo on Tuesday, maintained the civil servants had shown high level of understand and cooperated with the government when the state was in financial crisis. Aregbesola also named a triangular junction at the starting point of the former Olaiya-Odi-Olowo-Ita-Olookan road after the Apostolic Church. The Apostolic Church had been demolished to pave way for the construction of the triangular junction and reconstruction of the road. 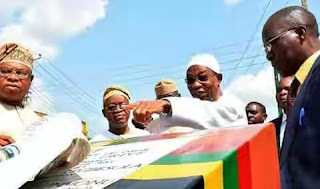 Aregbesola who disclosed that the fund for the road was sourced from the Omoluabi Infrastructure Conservative Fund, explained that he named the former Olaiya-Odi-Olowo-Ita-Olookan road after the workers to appreciate their steadfastness, sacrifice and loyalty during the financial crisis in the state. The governor stated that Osun workers bore the brunt of the financial crisis which was as a result of the misappropriation of the national resources by the Peoples Democratic Party (PDP). He described the workers as treasure and agent of change, saying that their support to his administration could not be overemphasized, just as he described them as the cutting edge instrumental to the realisation of the government's goals and aspirations for the people of the state. Aregbesola disclosed that 579 structures consisting of houses, shops, uncompleted building, mosques, churches and others were standing on the road before the reconstruction, adding that 170 people were compensated with N392m for the separation of their structures from road. The governor maintained that there should not be any need for separation of structures from the road had the properties owners followed the rules and regulations of town planning. Sympathizing with the property owners that were separated from the road in the cause of the project, the governor said it was the intention of his administration to make Osogbo a true state capital that will attract investors. Aregbesola who recalled the deplorable state of the road before the intervention, explained that the road was a death trap for many years with its narrow nature and pot holes at strategic points which led to accidents. Speaking on behalf of other royal fathers at the event, the Ataoja of Osogbo, Oba Jimoh Olanipekun, described Aregbesola’s administration as impactful and very beneficial to the people of the state. Oba Olanipekun who commended Aregbesola for the spate of infrastructure development in the state, particularly in Osogbo, said he was happy for the commissioning of the road because three previous administrations had attempted the project and couldn't complete it. Commenting, the labour unions in the state, led by the Chairman of the Nigeria Labour Congress (NLC), Comrade Jacob Adekomi, commended Aregbesola for his sensitivity to the plight of the workers, acknowledging that his administration has been workers friendly. Chairman of the National Union of Road Transport Workers (NURTW) and Road Transport Employers Association of Nigeria (RTEAN), Messrs Lekan Salami and Olajire Aweda respectively lauded Aregbesola for the massive road project and empowerment of the commercial transporters. Lord Mayor of Porto-Novo, Emmanuel Zossow who is in the state on an advocacy visit said he is amazed at the level of development Aregbesola has brought to Osun.